In that light, and in that spirit, “American Crime” is a regular feature of revcom.us. Each installment focuses on one of the 100 worst crimes committed by the U.S. rulers—out of countless bloody crimes they have carried out against people around the world, from the founding of the U.S. to the present day. This image shows the surface oil slick from the Deepwater Horizon oil spill. The slick covered 2,500 square miles. Credit: Andreas Teske, University of North Carolina Chapel Hill. THE CRIME: On April 20, 2010, some 50 miles off the Louisiana coast, methane gas burst from the Macondo well being drilled a mile under the surface of the Gulf of Mexico by the global oil giant BP. The gas surged up the piping into the Deepwater Horizon drilling platform and exploded, creating an inferno of flame and smoke. Eleven of the rig’s 126 workers were killed and 17 more injured. The platform was destroyed, the well’s piping ripped apart, and a toxic gusher let loose from the sea floor. It poured 210 million gallons of crude oil into the waters of the gulf before it was capped 87 days later. Satellite images showed the spill impacted 68,000 square miles of ocean—roughly the size of Oklahoma. Oil washed up on shores and into estuaries and wetlands in Florida, Alabama, Mississippi, Louisiana, and Texas. The BP oil disaster was the largest marine oil spill in history, and perhaps the U.S.’s worst environmental catastrophe ever. The oil spill savaged ecosystems from the deep waters of the gulf to its environmentally diverse shores—home to 8,332 species, including fish, birds, mollusks, crustaceans, sea turtles, and marine mammals. Many forms of life were killed, injured, or severely impacted. In 2012, scientists discovered fish with deep skin lesions. They also reported that 50 percent of the shrimp surveyed had no eyes or eye sockets. The impacts of the Deepwater Horizon disaster continue to be felt to this day. THE CRIMINALS: BP (formerly British Petroleum). BP leased and operated the oil drilling rig. It deliberately took risks with human lives and the environment to save time and money—including refusing to install a $500,000 acoustic shut-off switch that may have halted the oil blowout. Despite warning signs of trouble with the well, BP chose the less safe of two possible designs for the steel casing for the upper portion of pipe from the well, and refused to install additional “centralizers” to ensure the well was sealed to prevent gas surges. The day of the explosion, BP canceled a recommended test of the cement sealing of the well. Hours before the blowout, key indicators of leaks and building pressure were ignored or dismissed, in part due to time pressure to cap the well. BP also tried to hide the enormity of the disaster. 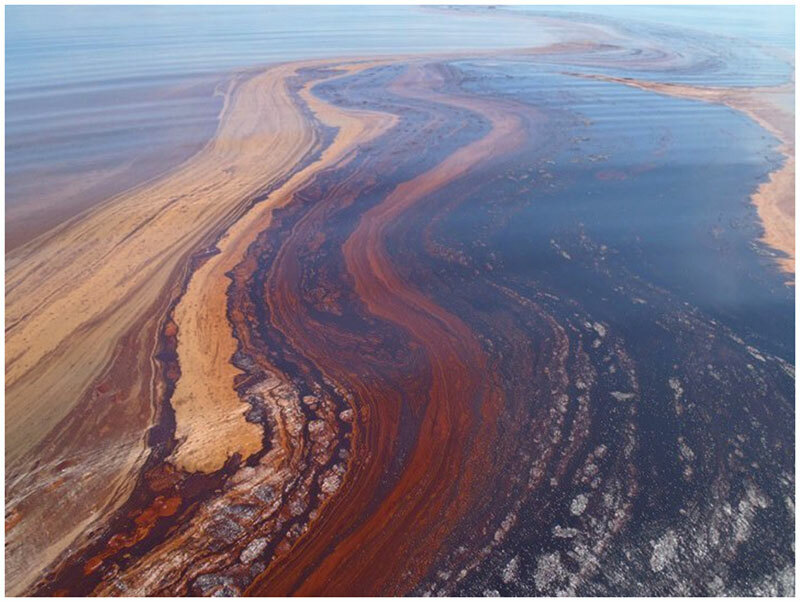 They tried to prevent oil from washing up onshore, which was certain to trigger a massive public outcry, by spraying and dumping 1.84 million gallons of chemical dispersant into the gulf. These dispersants broke oil into droplets, so it appeared the spill was gone. It fact, huge amounts of dispersed oil were collecting on the sea floor, severely damaging marine life and poisoning parts of the food chain (in a region responsible for 30 percent of seafood consumed in the U.S.). The Obama Administration: The administration covered up the size of the oil gusher, downplayed scientific data on the disaster’s long-term effects, and suppressed press coverage and scientific studies. It also worked to defuse public anger and discouraged initiative from below to repair the destruction. The administration never exposed BP’s lies and cover-up, and continued to allow BP to be in charge of efforts to cap the well and mitigate the damage. A few BP officials were convicted of criminal charges and given a few months of probation. No one went to jail for this crime. BP, Transocean, and Halliburton each paid fines and settlements (running in the billions of dollars for BP), but all remain major global corporations today. THE ALIBI: BP’s September 2010 report admitted no corporate malfeasance or negligence, instead saying that testing, technical, and maintenance errors caused the catastrophe. “A complex and interlinked series of mechanical failures, human judgments, engineering design, operational implementation and team interfaces” by “multiple companies” were to blame, according to BP. The U.S. government’s report blamed “human failings” and errors, not criminal intent or activity of the oil companies, or even “a contemptible desire to do dangerous things on the cheap,” as one newspaper editorial put it. THE ACTUAL MOTIVE: The risk-taking, time-saving, and cost-cutting actions by BP (and Transocean and Halliburton) that led to the Deepwater Horizon disaster did not come from “human failures” or “errors” but were “embedded” in BP’s culture, as one expert on industrial disasters found. This culture in turn was embedded in something deeper: the necessities imposed on BP by the workings of the capitalist-imperialist system to expand and outperform competitors in order to survive. In BP’s case, when the Deepwater Horizon exploded, it was the world’s fourth largest private corporation and one of the most profitable—making $17 billion in 2009. But in the 1980s, BP was much smaller, crippled by the takeover of its Iranian oil reserves by the Islamic fundamentalist regime following the 1979 fall of the U.S.-backed Shah, and weaker than its bigger rivals. In response, it aggressively expanded over the next decades with risky big bets. It acquired other oil corporations. And it became a leader in deepwater oil drilling in places like the Gulf of Mexico, where the greatest untapped energy reserves and profits are to be found, and often the risks are the greatest. BP became the world’s second largest oil company, but by the 2000s it worried it could be crushed by competitors unless it streamlined its operations and slashed costs. Between 2007 and 2010, BP laid off 7,500 employees and cut costs—$4 billion in 2009 alone. All this contributed directly to accidents in 2004 and 2005, which killed 17 workers and injured nearly 200; to a 2006 spill of 260,000 gallons of crude into the Alaskan wilderness; and finally to the Deepwater Horizon disaster. Control over oil is a crucial source of U.S. economic, geopolitical, and military power. (The U.S. military is the world’s single largest purchaser of oil.) This is why, among other things, the Obama administration whitewashed BP’s crimes and cover-up. And it is why, by October 2012, Obama had issued 90 new drilling permits for wells over 500 feet, more than were issued in 2010 and 2011 combined. And this is why even after the Deepwater Horizon catastrophe, the Obama administration continued to push for more oil and natural gas production. Under Obama, oil and natural gas production rose so sharply that the U.S. has now overtaken Russia and Saudi Arabia as the world’s largest producer of both natural gas and oil—the fossil fuels which devastated vast swaths of the Gulf of Mexico, and whose burning is a main driver of global warming.